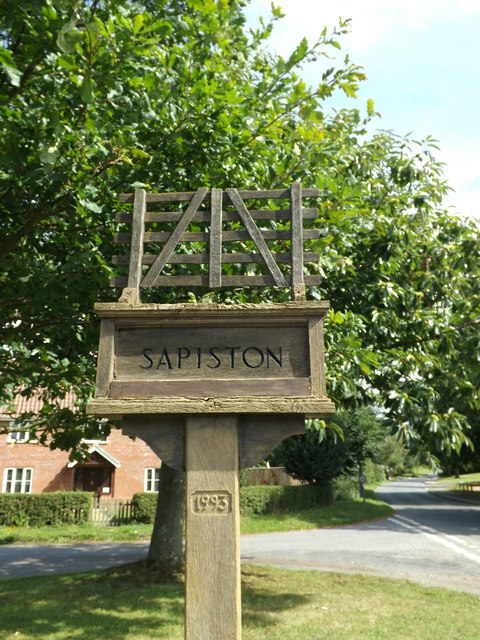 The name Sapiston means village of soapmakers. The village was originally right by the ford across the Blackbourn (or Black Bourn), but during the 14th century the entire village moved a few hundred metres north to escape from the Black Death. Now only the Church of St Andrew and The Grange farmhouse remain at the village’s original location. It was in Sapiston that the Suffolk poet Robert Bloomfield, author of "The Farmers Boy" (1800), worked from the age of ten to the age of fifteen. He was a farm labourer on the farm of his uncle William Austin (who is buried in Sapiston churchyard). Bloomfield was born in nearby Honington, and the church there contains a memorial to the poet, as well as many notes from admirers. To find the cache first solve the puzzle.